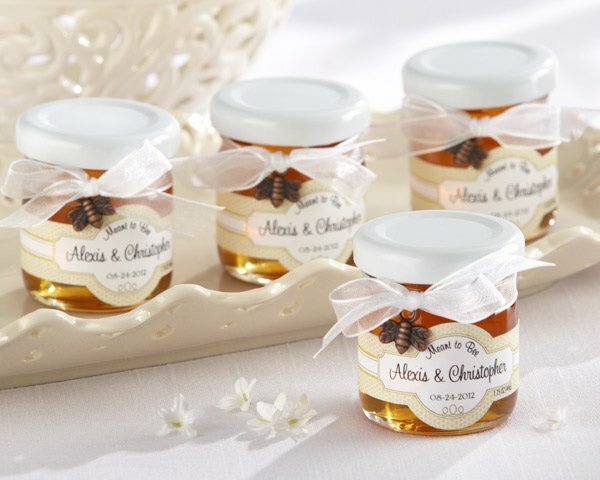 Nothing could "bee" sweeter than these Personalized Meant to Bee Honey Wedding Favors! Our petite jars measure 2" tall by 1 3/4" in diameter and hold approximately 1 3/4 ounces of gourmet clover honey. We'll also send personalized labels with the phrase "Meant to Bee" on top, your names in the center, and your wedding date along the bottom edge. Minimal assembly is required to attach bows, charms and labels to each jar. The favors are finished with a white organza bow and bronze bee-shaped charm. Note: Please do not store honey in a cool place, as this can hasten the natural crystallization that can occur in real honey. Crystallized honey is still perfectly edible and can usually be restored to liquid by warming the jar. I need approximately 25-30 jars. How much is shipping and how long does it take to get them. You can enter your zipcode in the delivery times section below the product description to get the estimate delivery date and cost. How many ounces of honey in these jars? The Personalized Meant to Bee Honey Wedding Favors (Set of 12) can hold approximately 1 3/4 ounces. is the honey sold separetly or is it included in the jar? Hello, Im interested in purchasing several sets of the personalized meant to bee honey wedding favors. my question is if i purchase several sets now, would the honey crystalize? It won't. Just don't store the honey in a cool place, as this can hasten the natural crystallization that can occur in real honey. Crystallized honey is still perfectly edible and can usually be restored to liquid by warming the jar.